eTravos develops white label travel portals and mobile apps for startup's, travel agents and corporate companies. The travel inventory of these white label portals comes from different associated api's to eTravos single api. 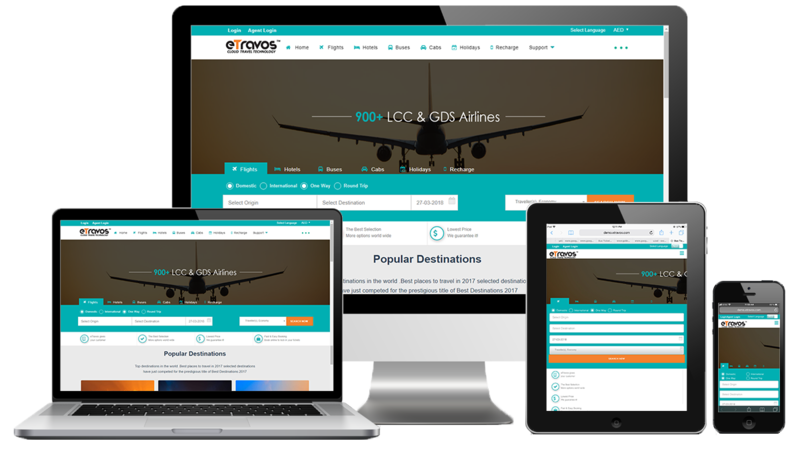 The eTravos White Label option a ready-to-go co-branded or white-labelled template solution gives site visitors easy way to plan their travel bookings using your website, while seeing your own branded name and your customized website design as per your requirements. Ever since we’ve launched our flagship cloud based www.eTravos.com SaaS (Software as a Service) our prospective clients are enquiring us about what type of application is suitable for their business needs. What’s the difference between a SaaS (eTravos) offering and an independent website (or custom developed website). With this article, which is a simplified enough to make it easier to understand even by the non-technology background clients, we are trying to help our client in decision making process . Read on to understand the differences and make a decision based on your understanding. In case you still need some assistance feel free to get in touch with our support. In plain English Cloud SaaS is a new delivery model which is centrally hosted by the service provider and operates on monthly, annual or some fixed interval subscription basis. It’s a standard service that has very limited scope for customization. Here you don’t own the source code or database. You can’t host it with the provider of your choice as the hosting responsibility lies with the service provider. Most of the SaaS follow multi-tenant architecture i.e. 100s of client can access the service which has a single codebase and may be a single database. eTravos White label Travel Portal is a single click solution for travel agents willing to show Bus, Flight, Hotel, car, Holiday Packages into their websites. The clients can gain the multiple inventory sources for their bookings conveniently. Dynamic packages can be accessed instantly with greater levels of convenience. What we get in whitelabel? multi-currency and, multiple languages so be partnered with the eTravos white label solution to enhance your global travel, services with ease and trust worthy support. B2C Business to Consumer, B2B Business to Business, B2E, Business Corporate, B2B2B Business to Business to Business Quick payment gateway integration for accepting online payments. How can I launch my own white label travel portal? Registration: The registration process takes less time, pay the setup cost and get agreed with our sales team. Select your own branded Domain: It’s very easy to connect our White Label platform to your selected domain by mapping CName record to our URL, but our technical support is always here to help out, if needed. Set up White Label: Simply select a theme from 100’s of themes available on the eTravos Website, if not you can design your own html page and host at your own space. Select Payment Gateway: Choose any one of the selected payment gateway available with eTravos. This make your users to visit your website and book the tickets online. Note: White Label wont work on the search engine crawlers (except the main home page or customized pages which designed by the user). If you are planning to do the search engine marketing of your whitelabel site, make an SEO-URL friendly website and include the Search Panel wherever you ever need. Then put White Label on a main domain or subdomain, where airlines, hotels or car rentals ticket search results will be booked. Knowledge of basic HTML and CSS is required. Go online in only 2 weeks’ time!